Dial. Used - Good. Former Library book. Shows some signs of wear, and may have some markings on the inside. Dial. Used - Very Good. Former Library book. Great condition for a used book! Minimal wear. Dial Books, 1995-11-01. Hardcover. Good. A slightly used former library book with plate inside, covered dust jacket, beautiful work in black and white, first edition. New York: Dial Books. Very Good in Very Good- dust jacket. 1995. First Edition. Hardcover. 0803718047 . Faint toning, one hinge cracked, and jacket with toning and rubbing, a few tiny tears. ; Oblong 4to 11" - 13" tall . Dial Books. Hardcover. 0803718047 Like New Condition. . Fine. 1995-04-02. Good. Ships with Tracking Number! INTERNATIONAL WORLDWIDE Shipping available. May not contain Access Codes or Supplements. May be ex-library. Shipping & Handling by region. Buy with confidence, excellent customer service! New York, New York, U.S.A.: Dial Books for Young Readers, 1995. hardcover still in shrinkwrap, journey of enslaved Africans across the Atlantic. Hard Cover. Near Fine/Very Good. 4to - over 9¾" - 12" tall. Dial Books. Hardcover. 0803718047 New Condition. . New. NY: Dial, 1995. Hard Cover. Fine in a Fine dustjacket. Book is in unread condition. . First Edition, First Printing. New York: Dial Books, (1995), 1995. 1st Edition . Hardcover. Fine/Near Fine. Oblong Folio. Tom Feelings. Unpaginated. Illustrated in black & white. Map. Introduction by Dr. John Henrik Clarke. Stated First Edition with the "1" in the number sequence. Story of the terrifying journey of African men, women, and children told in 64 extraordinary narrative paintings. Dust jacket protected in a new mylar sleeve, not price clipped. No former owner's names or marks. A very clean, gift quality copy. Dial Press, 1995. Uncorrected proof/media kit for reviewers in advance of publication. Contains 14 of the 64 paintings and the uncorrected text for the preface by Tom Feelings as well as the intro by John Henrik Clarke. A NYT article, advance quote and other reviewer materials laid in, in a clear plastic carrying case. Contents as new; minor scuffs to carrying case.. First Edition. Staplebound in Wraps. As New. Book. Dial Books, 1995. First printing. Oversize oblong quarto. Black cloth binding, gilt titles at spine, blindstamp title at front. With an Introduction by John Henrik Clarke. Printed in monochorome on matte-finish paper. 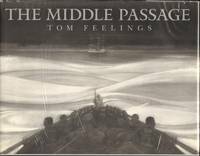 Feelings' intensely personal art depicting this period in African-American history. Book unread, as new. DJ near fine with a small nick at spine. 80 pp.. 1st Edition. Hardcover. Near Fine/Near Fine. New York: Dial Books, 1995. Hardcover, large oblong folio bound in black cloth and publisher's non price-clipped dust-jacket. 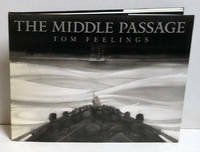 Illustrated with 64 black and white narrative paintings. Ten page historical introduction by Dr. John Hendrik Clarke. First edition, first printing with full number line. Signed presentation copy by author/artist, boldly signed in white on black front end-paper and dated '98. A Coretta Scott KIng . The story the Atlantic crossing told from the slave's perspective in graphic form, without text. Award winner. No previous ownership marks. A clean, square, unmarked copy, as new. Fine in a near fine dust-jacket. . Signed by Illustrator. First Edition. Hardcover. Fine/Near Fine. Folio - over 12" - 15" tall. 1997. VF as new copy with a DJ with a tiny snag on side of spine, a minor flaw, still first printing of important Corretta Scott KIng Award winner,, a book about one of the most tragic ordeals in history; the cruel and terrifying journey across the Atlantic ocean by enslaved poeople of Africa, mint copy in dj, as issued, not price clipped, flat signed boldly by the author illustrator on the title page, WITH MINOR FLAW IT IS STILL a beautiful copy of a collectable award winning book . Signed by Author and Illustrator. First Edition. Cloth. As New/Near Fine. Oblong. New York: Dial Books, 1995. First Edition, First Printing. Hardcover. Fine in original. Oblong quarto. 13.75 x 10.5 in. UNpaginated. Fuly illustrated in black & white. Signed by Feelings in silver on front free endpaper.